The impeachment motion against President Park Geun-hye passed at 4:10 p.m., Friday. Out of the 299 votes cast, 234 votes were in favor of impeaching the president, 56 were against, two were withdrawn and seven were invalide votes. Vote count begins at 3:54 p.m. for the impeachment of President Park Geun-hye. Vote for the impeachment of President Park Geun-hye began at 3:23 p.m. on Friday. The National Assembly started its groundbreaking plenary session at 3 p.m. Friday to vote on the impeachment bill of President Park Geun-hye. 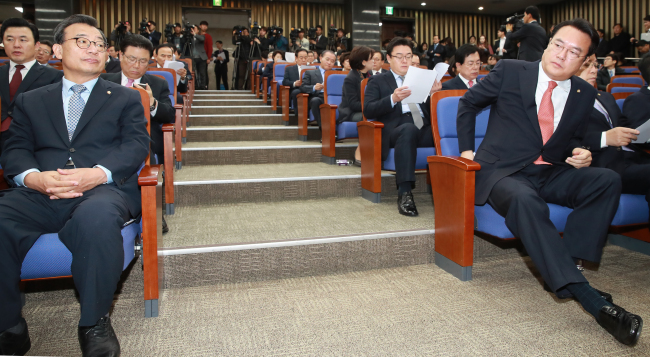 Political parties entered the parliamentary hall on time, but several seats in the ruling Saenuri section remained vacant until the last minute, reflecting the reluctance of those loyal to the embattled president. In the audience were 40 bereaved family members of the Sewol ferry victims, who showed up upon the invitation of the main opposition Democratic Party of Korea. The embattled incumbent president has been facing calls to withdraw from power for her alleged involvement in an extensive corruption scandal that includes her longtime friend Choo Soon-sil. She has also come under fire for failing to make key rescue decisions during the Sewol ferry sinking incident in 2014. “We have realized that truth (concerning the Sewol accident) may never come to light as long as the Park administration is in charge,” said Yoo Kyeong-keun, the committee head of the Sewol Families for Truth and a Safer Society. The participating members pledged to exert pressure upon the parliamentary floor to vote in consent of impeachment and thus embrace the public sentiment. 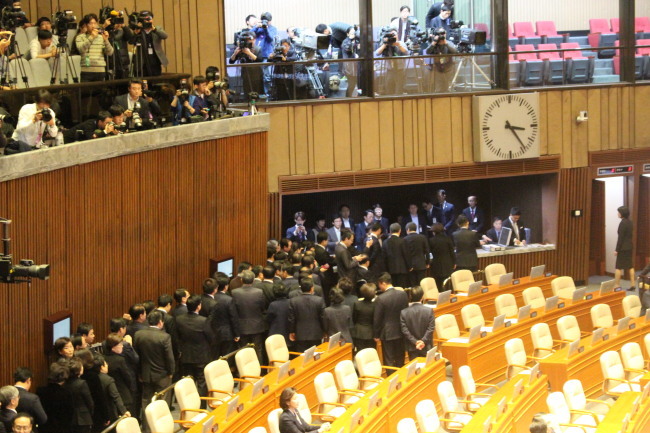 Shortly after the opening of the session, Rep. Kim Kwan-young of the runner-up People‘s Party presented the impeachment bill to the floor, stating President Park’s violation of the nation‘s Constitution and other laws. Thousands of citizens have gathered at the front gate of the National Assembly building on the day of impeachment vote in a last-ditch effort to pressure lawmakers to pass the motion. They made impromptu speeches on a makeshift stage and sang Korean folk songs. They also put up yellow flags bearing various messages condemning President Park. 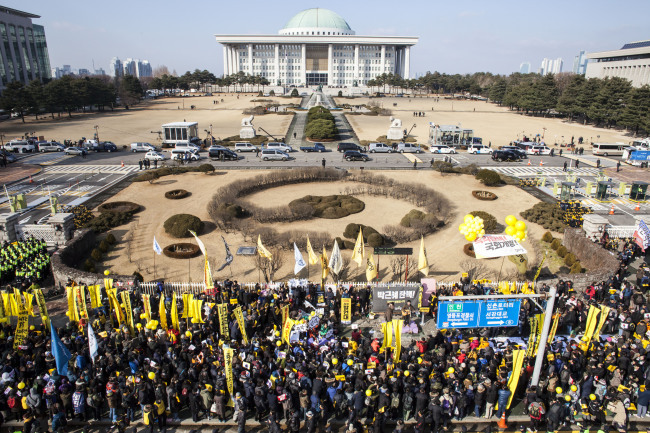 Protestors relentlessly chanted “Park Geun-hye, resign,” while facing the national assembly building. Many of the protestors echoed hope for a better, more just society by impeaching the president. If the motion does not pass, many said they would continue to fight until she resigns. In this afternoon, South Korea’s parliament will vote on whether to impeach President Park Geun-hye over an influence-peddling scandal involving her secret confidante Choi Soon-sil. Cheong Wa Dae maintained a cautious silence on Friday morning, with hours left until the parliamentary vote on President Park Geun-hye‘s impeachment. 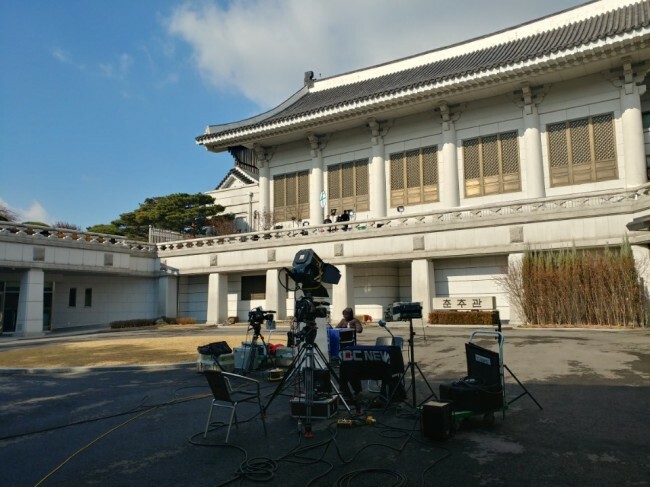 While broadcasting vans filled the parking lot in front of the Blue House’s press room building, the president and secretariat members refrained from appearing in public or making official remarks. 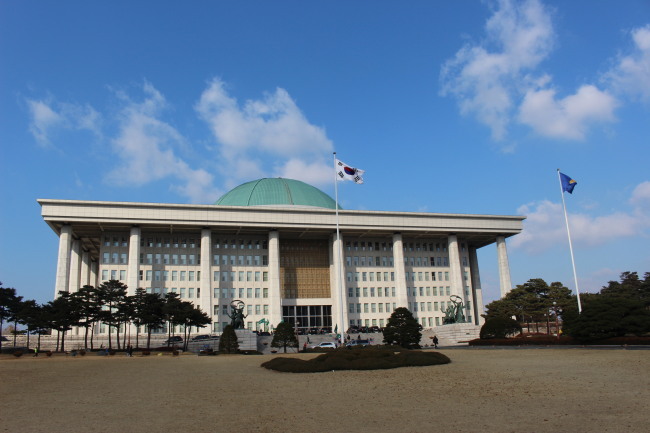 Presidential Chief of Staff Han Gwang-ok chaired a meeting of senior secretaries in the morning to discuss countermeasures to possible impeachment. The parliamentary floor vote on ousting the president is to start at around 3 p.m.
“All we can do is keep watching,” said an official under anonymity. 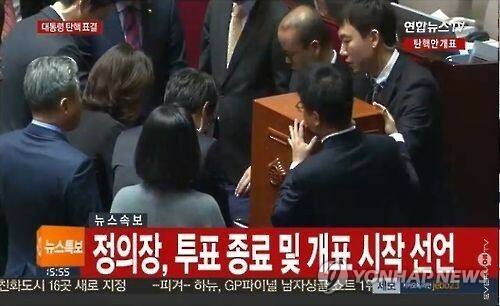 Meanwhile, Park was said to be in her presidential residence in the morning, keeping away from the operation offices and watching the situation in Yeouido on television. Groups opposing and demanding Park’s impeachment are rallying outside the National Assembly. A group of Park’s supporters have quarreled with a liberal activist. A dozen police buses are lined up to block access to the parliamentary compound, a preventive measure in case angry protesters try to break into the parliamentary buildings. The Assembly has decided to shut down the buildings if the impeachment vote falls through. For lawmakers from rival parties, today's vote is crucial. Their political fates will surely change dramatically, depending on the outcome of the impeachment vote. Here are some of the quotes from senior politicians on the coming impeachment vote. The crucial vote day on the impeachment of President Park Geun-hye has arrived. A quiet, but tense atmosphere is surrounding the National Assembly in the morning. 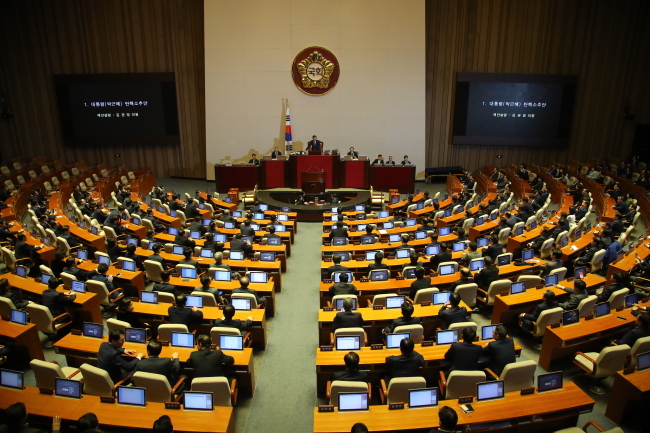 Members of the main opposition Democratic Party of Korea and another Saenuri Party group are also in seperate discussion over their stance toward the presidential impeachment vote, the second of its kind in Korean history.